.. is what I ask of you dear daughter for the last proper update I did for you was at 14 months and now you stand just 2 weeks short of your 2nd birthday!! *gulp* Before you shout "Sacrilege", let me just tell you that I have been making notes of the giant leaps which have been the last 10 months for you and I'll publish them here, just like that, in bits and pieces for your birthday :) I know you'll forgive me because finally there's one person for whom I know I am the world and that's you :) As for now, life's really cool for you. You drink juice straight from the box and get away with it with just an impish smile and your signature coy expression of putting your hands on top of your face and giggling. You get to play the patient to a doting doctor you have for a brother. And you get to watch your favorite videos with breakfast served right there. Must feel like heaven, eh?! And forgiveness is what I ask of you dear readers and friends for still not posting the promised Kasauli pics. Let's just assume that I have been keeping quite busy and I'll post them soon. So "Friends, I have been keeping quite busy and I'll post them soon! Till next time Chao!" Each one is so cute. Esp. love the one in front of the TV. Royal treatment! 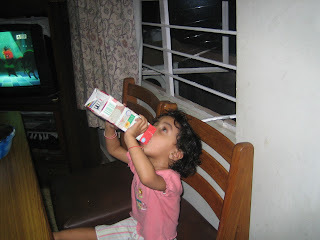 she is so cute.. juice straight from the box and breakfast in life.. aah being 14 months old is heavenly!! I tell ya the younger ones get their best. Such a cute post. 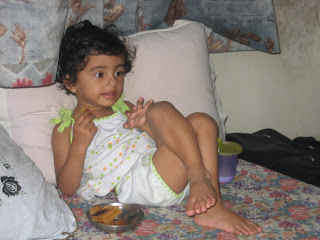 Love to see that watching TV in a perfectly relaxed mood like most adults by a going to be 2 year old. All are very cute.Thanks for sharing with us here. Neeraaaaa!!!! I am so sorry - I have not visited in a while! Oh man they look soo cute - playing doc and patient. KB never tries to make KG her patient - only the adults in the family or his other friends. I should tell him to try this. It looks soo cute! And she looks like a queen in the last pic! And I just read your post about Vansh - neera - I wish I had read it when you just posted it - but really I have been looking up books on parenting a four year old since last night - the changes I see in KB from this sweet affectionate boy to this boy who is capable of saying kind of rude sounding things to my mother - like - no, you can't come with us, you stay here etc. Makes me so upset and I wonder what I did wrong...and then I read this...I feel so much better. I keep wanting to write a post on so many of these things but I just can't get down to it. No time at all feels like...am so tired at the end of the day - really battling KB takes so much time these days...anyway - now that there's two of us going through the same sort of thing, I know it is a phase and when they are five it will be good. My friend also told me that with her daugther the two's were not as terrible as the four's. So may be just that...don't worry!